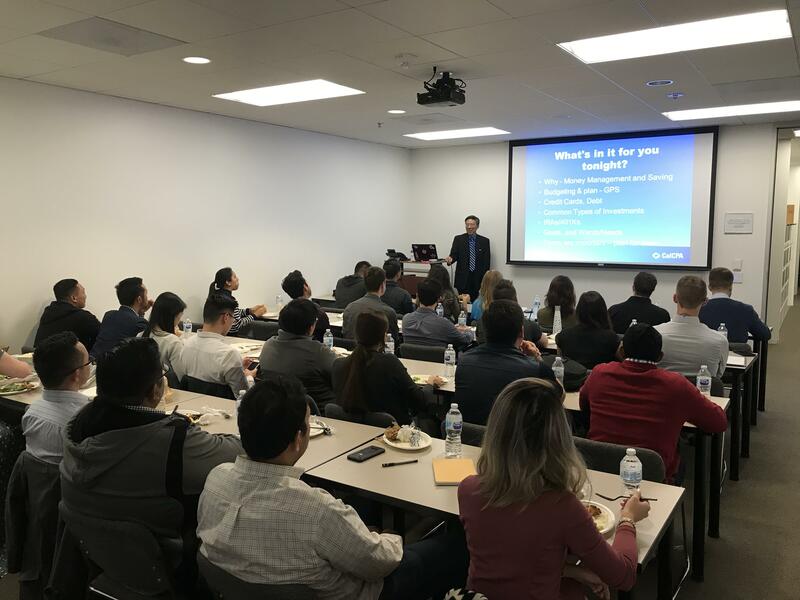 CalCPA provided a speaker to give one of their "Dollars & Sense" workshops. CalCPA is an organization of over 40,000 California CPAs. They have been offering continuing education to their members and educating the public on financial issues for decades. They arranged for Dwight Nakata to teach the workshop. Mr. Nakata is a Certified Public Accountant and a Certified Financial Planner. He earned his degree in business accounting from CSU Los Angeles 36 years ago, and serves on their board of directors to this day. He is an Adjunct Professor at Santa Ana College, so he regularly teaches people financial literacy. Before the event, I sent him a list of questions that attendees had, and he tailored his presentation for us. As this was my first event as co-chair of the YMF Programs Committee, I was nervous and excited watching the number of paid attendees rise to 38. Luckily, the amount of help and support from my fellow younger members was overwhelming. Jason Fix reached out to CalCPA and confirmed the date. Daniel Keady volunteered the full-sized classroom at his employer, Tetra Tech, for the event. Melissa Hilsabeck, Programs Co-chair, ordered and picked up the food. Jazzy Quinabo, who has been on assignment in Hawaii, still managed to attend, provide the laptop for the presentation, and bring cases of water! I designed the flyer, set up the EventBrite, sent out the e-mail blasts, and beeped people into the surprisingly secure elevator. The event really was a team effort! Dwight Nakata started off the presentation with the basics of personal finance. It was really valuable to hear about all the different kinds of clients he has, from all walks of life. One important point he made is that he has two types of clients, those who are rich, and those who live richly. He said one of his wealthiest clients is a gardener who lives within his means, saves, and invests his money wisely. He also changed my mind about where to invest my retirement. I always figured my Roth 401k was my one-stop shop for retirement success, but he stressed that it's worth considering putting some money into a tax-deferred account, because it gives you more options to limit your tax liability when navigating the start of your social security benefits and those pesky minimum distributions. The dizzying wealth of information left us all wondering how we could benefit from a financial planner. Mr. Nakata never came across as trying to sell us something, which I really appreciated. We basically begged him to give us some kind of ballpark for how much a financial planner charges. He said that there are a variety of pricing options, but that we could expect to pay between $500 and $1500 for professional advice. I admit, as a self-proclaimed cheapskate, this sent me reeling, but then he gave some perspective that I'll always remember. You'll pay much more for a real estate agent, and one could argue that your financial future is far more important. In the end, it was a very well attended and successful event. Recently, the LA YMF reached out to me asking how they could organize their own financial workshop. I'm so proud to be a part of an organization that is making a real impact on our engineering community.